If you stopped by the University of California Botanical Garden in Berkeley, CA, in June, you might be forgiven for thinking wood nymphs were among us. Botanists and fashion enthusiasts alike gathered at one of the Bay Area’s most treasured gardens for a delightful afternoon of fashion and biodiversity. Curated by Sasha Duerr, founder of the Permacouture Institute, co-designer of Adie + George, and author of The Handbook of Natural Dyes, the event featured 10 of the region's top emerging designers. As a master plant dyer, Duerr couldn't have been a better choice. The garden, after all, features over 13,000 plants, all collected from the wild, and is a destination for plant lovers from around the globe. While all designs showcased organic, recycled, or refashioned materials, the emphasis was definitely on the dyes, all of which can be found in the garden. The colors that resulted—bright lavender and yellow from pounded cabbage and nasturtiums (in Spikit designer Ariel Bishop’s case) and deep reds and browns from madder, osage, and logwood (Angelina DeAntonis of Ocelot)—took us by surprise. While all designs showcased organic, recycled, or refashioned materials, the emphasis was definitely on the dyes, all of which can be found in the garden. The party began in the lush redwood grove, where guests sipped on bubbly champagne. 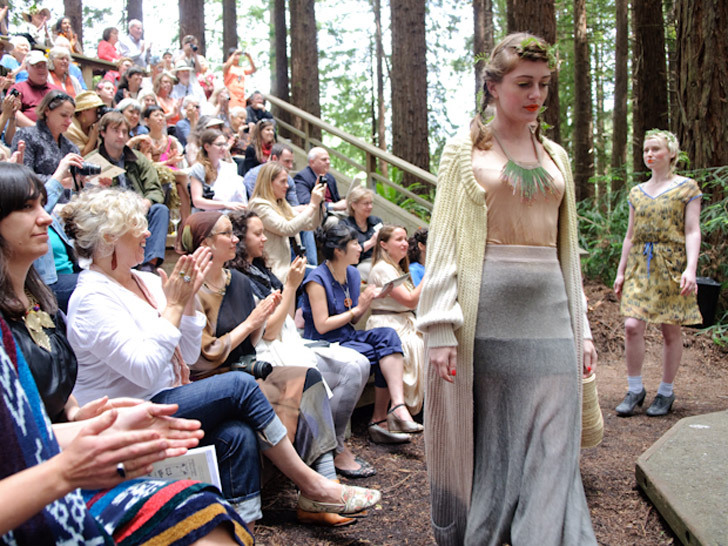 From an amphitheater, set in the tall redwoods with sunlight filtering through the treetops, the fashion show began with a single model appearing through the trees in a creamy, flowing silk gown. The natural beauty and the large scale of the redwood trees made the connection between our clothing and the earth especially clear. Other designer included Moriah Carleson and Alice Wu of Feral Childe; Molly de Vries of Ambatalia, Nicole Markoff of Nicacelly; Amber Ella Elandt,, Cory Gunther Brown and Cassidy Wright of The Moon; and Skye Schuchman of SkyeDesign. Makeup and hair stylist Shawn Burke wove flowers and other greenery into the models’ hair and made faces glow and pop with bright lipstick and metallic eyeliner. Aside from the fashion show, guests enjoyed live music, local and organic food and beverages, and both live and silent auctions (one lucky bidder won a private party atop UC Berkeley’s historic Camanile). We look forward to next year’s event! A skirt by Adie + George, made with West Coast-sourced alpaca and dyed with avocado pits. To the left, Ambatalia's hemp tunic and reclaimed knit pants, both dipped in distaff. On right, a hand-stitched halter dress made from reclaimed Cone Mill denim, also by Ambatalia. A paper-birch-inspired gown by Sarah Borruso of Stars + Ravens. A Botanical Garden-inspired dress by Skye Schuchman of SkyeDesign. 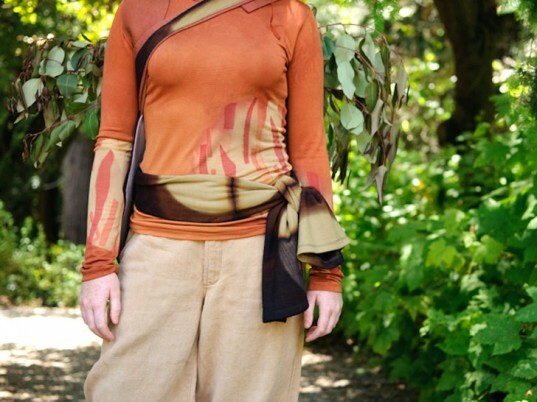 Ocelot Clothing's Angelina DeAntonis uses the ancient Shibori practice of itajame (fold-and-clamp resist dyeing). To the left, a cactus-inspired ensemble by Ariel Bishop of Spikit. On right, a cabbage-dyed top, also by Bishop.